Ever upward through the clouds. In ever faster succession along the rising grey rock. Soaring proudly upward beyond the clouds. Its foundation the headstone of mankind. To build to new dizzying heights of understanding and control. Stands firm, and proud, and glorious. . .
And hurled as meteors in all directions. Threshing the bones of civilizations. A tower crumbled suddenly, into rubble and mounds. “The Skyscraper,” by Benjamin Guterman originally published in Forum (1969, City College of San Francisco). There seems to be a tension in people’s talk these days. Their speech is nervous, impatient. All of this, of course, is the reflection of fear–fear of their war-baby that killed so many Japanese so quickly. Maybe people are beginning to realize that you can’t be relaxed and charming while balancing yourself on a tightrope with madmen trying to cut the wire. “Ten-Second Sermon,” by Jack Hulse originally published in Forum (1949, City College of San Francisco). And leaves a wedge of concrete gaping wide. And curls around the mountain tops at night. Of dying towns, rotting and hollow faced. Trails chalky white against the blazing sky. The concrete has no purpose and no end. “The Highway,” by Fred Mayer originally published in Forum (1945, City College of San Francisco). 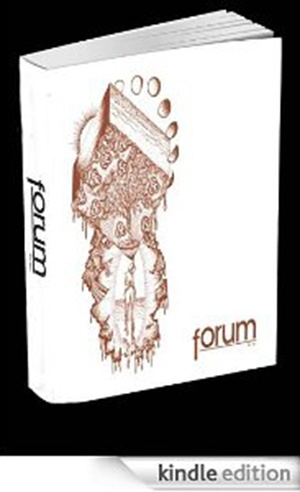 “(untitled),” by J. T. Grogan originally published in Forum (1965, City College of San Francisco). It was about two o’clock when I walked by the fountain. I remember it clearly because I was not wearing a watch. When you don’t wear a watch and you walk through a large city, you become acutely aware of all the time pieces that are on public display. There are digital clocks in bank windows. There are old clocks–with hands–in government buildings, and all of those clocks look just like the ones that hung in classrooms when I was growing up. Up there on the wall above the drinking fountain where you were only allowed to drink for a three-count and some kid behind you always said ‘hey, save some some for the fish,’ and you said ‘I’m fish’ and the poor kid who was in charge of holding the drinking fountain handle down for everybody’s three-count was suddenly struck in the uncomfortable position of taking sides. And those clocks were always behind the desks so the teacher could see if you were a clock watcher. When I was young, clocks were menacing, in whatever form. Bedtime. Time to come in for the night. Time for church. Thirty more minutes of class. But walking through a city with no watch on your wrist, clocks are comforting. They keep you grounded when it’d be just as easy yo really lose your mind. To just duck into a bar at lunchtime and keep drinking and not go out and not go back to work and really just lose–your–mind as you realize that you are one of those guys that you used to pity when you walked by a bar in the afternoon and looked in and saw that there were actually people who sat in those depressing places with martini glass neon signs in the window. Aww–tahp–see. Say it. But when you’re saying it thing about a big, old, overstuffed chair with a handle on the side that makes a big, old, overstuffed footrest pop out from underneath. Say autopsy and think of the chair that your grandfather used to sit in when he did his crossword puzzle with a pencil. And your dad, his son, always did the puzzle with a pen and even when you were little you knew that your dad was accusing his dad, your grandfather, of some heinous thing. He was saying ‘I don’t need no damn eraser, you worthless old fool, why don’t you just die and leave me alone.’ Or something like that. On second thought, don’t think of your grandfather when saying the word ‘autopsy.’ But think of that chair and pretend that it belonged to one of your grade-school teachers. One of the nice ladies who wasn’t so pretty that she would betray ou and make you feel bad, but who was just pretty enough and smelled nice. One of the pleasantly plump teachers that would always smile at you when things weren’t going too good, smile like to say, ‘I’m with you, not to worry.’ Think that that chair is in her family room and she’s just taken you out of school to go and live with her. But when you’re inside one of those lounges that’s actually really a bar, all you can feel around you is moisture in the air. Like your grandpa just spilled something sticky and sweet all over the chair. The chair’s not the same. Moisture hands in the air, weighing on the spirit of the place like the spirit was just thrown into a lake–no, a pond–while it was wearing blue jeans. It takes a long time for blue jeans to dry out, and when they do they get all stiff. And the light in a lounge that’s really a bar is a color that can’t exist without that moisture, and that neon martini glass in the window, and a little bit of smoke. The light is like a bruise, but a light pleasant one. And all day long you sit there and secretly poke at that bruise, continually reassuring yourself that you can feel things, and even though you know bruises hurt, it feels good to have one and you poke it again, only harder. You can lose track of everything around you when you’ve got a bruise to occupy your time and your nervous system. A bruise like that is what it’s like when you are used to wearing a watch, but one day when your hands are shaking so badly that you can’t even turn the page of the newspaper, so you leave your kitchen in a panic, forgetting to put your watch on. At first, when you’re walking along, you look at your naked wrist every few seconds, and each time the watch isn’t there you feel like you’re going to vomit again, but then you begin to notice that somebody else ha been through it all before, and they’ve thought to put up clocks everywhere, so when you almost lose your mind and duck into a bar, you see what time it is and you feel like you can go back to work. When I walked by the fountain, like I said, it was about two o’clock. I know because I asked a guy at a news stand, even though there was a big clock tower right on the edge of the park I just wanted to hear as voice or anything really. When you’re walking by a fountain in a big green park and it’s summer and flowery around the fountain, and yo see a man standing in the fountain with his pants around his ankles and he’s urinating into the fountain, and people are walking by ignoring it, or may be noticing it and chuckling or not even thinking its all that odd, and he’s looking right at you and you see that even he’s wearing a watch. Well th-that can sometimes be more than a person can take. And then there’s a guy at the bar in the lounge who sits down next to me and I think, cool, this guy looks normal he’s young and wearing a suit and you can tell how strong what he’s drinking is cause it’s only a beer, and he starts to talk about a guy, a painter named Vuillard, (Vwee-yarr, he said) ‘Vuillard shoulda been born in 1969,’ he said, and I told him I didn’t get it and he said Vuillard was a painter. This old dead painter in France who never left his home, lived with his mother, never married anybody or even felt like he should get married–or that he wasn’t normal for not wanting to sleep with every woman he saw. ‘Or maybe he did feel like he should,’ I told the guy and he said ‘well, whatever.’ He didn’t want me to talk just yet, and that can hurt but I listened anyway and besides, where was I gonna go? Sure as hell not out. Not just yet. But he said that this man made the most beautiful paintings, full of furniture and flowers, especially the wallpaper, he said. The wallpaper was’t like wallpaper in on the inside of houses, but it was like this guy turned a sheet of old wallpaper into a garden full of flowers. And he said this guy Vuillard painted all of these beautiful paintings. And even the ones he painted that were scenes of outside things were all encircled like a womb (that’s what he said, like a womb) with the sill of a window, so you always knew that the garden was being looked at through a window that had a sill like the guard rail on a crib, and draperies like the arms of a sweet smelling grade school teacher. This is what he said! “the arms of a sweet smelling grade school teacher,” and I looked at him and thought “aw–tahp–see,” cause that’s what that grade-school teacher thing he said made me thing. How much the name Vuillard sounds like ‘autopsy,’ I thought, and then I thought that being dead for that painter was probably a lot like being alive, with lots of furniture and wallpaper that was like a garden. Sometimes when you close your eyes real tight you can make colors that look just like some technicolor sitting room out of the sixties with all sorts of sectionals and cubic end-tables and odd shaped purple hanging plants. Death might be like having your eyes closed real tight. And the man at the bar looked real serious for a second, looking down at his beer and I thought he was gonna cry, but instead he just chuckled and said, ‘I guess you can’t just take yourself out of the world like that anymore, huh? You can’t just say to hell with it I’m gonna stay in this room, which I know is beautiful, and not take any chances.’ I finished my drink and looked at my wrist, which was empty, and the guy saw me looking at my wrist and said, ‘don’t worry, last call’s not for another thirteen hours. “Vuillard,” by Hunt Baldwin originally published in City Scriptum ([Forum] 1993, City College of San Francisco). No one ever told me that Grandma Rose was a lesbian. She was my father’s paternal grandmother. And since her divorce in the late 1920’s had been living with Olive. I remember spending many weekends with them in their apartment. Assigned to the guest room, I never ventured into the room at the end of the hall. I feel foolish now for not considering the possibilities of their relationship. Did the rest of the family succeed in never knowing the truth? With Grandma Rose looking like such a typical grandmother, her hair wrapped in a braided bun, it’s feasible that no one knew. But olive, with her jet black hair cut so short, ivory complexion always without make up, and men’s suit and ties, was the epitome of lesbianism. It wasn’t until I was in my mid-twenties, and they both had died, that I began to question their relationship. When I look back, I wonder how identifying with them could have assisted me in my own struggle for self-acceptance and development as a gay man. While I was in high school I might have been able to sit through the evening news with my parents. Every night I dreaded there would be another story about the new gay cancer. I tried to check on dinner or hide in the bathroom so I could avoid the horrible picture that would flash on the screen. The picture I was sure, would be my fate. The image of emaciated dying men with purple spots and no hair. Gay men and women don’t live productive lives or have meaningful relationships, and certainly aren’t anybody’s great-grandparents. Not much later, when I was still a teenager, I was able to get into the bars and clubs. I thought I had found nirvana, dancing the night away with my shirt off, the gay night life of San Francisco, the ultimate. But, I’d yet to have a real conversation with anyone, let alone in the daylight. What’s the new club on Thursdays? Who has an after-hours tonight? Where can I get the best ecstasy? What did all these people do when they weren’t at the clubs? About the same time, Rob, a dear friend event today, had the insight to come out to me. We had grown up just two blocks away from each other and were both ecstatic to have found friendship. A gay comrade with whom I could tackle society’s ideas of who I was and how I should live. We decided that we would attend our first gay pride parade together, we even arrived early, ensuring a good vantage point. I was blown away watching the entries march past: Dykes on Bikes, employee groups, AIDS volunteers, civic leaders, and the Sisters of Perpetual Indulgence. The gay community was doing incredible things; the diversity of the crowd was astonishing. Thousands of gay men and women marching uo Market Street, each with his/her own story, for unity as well as independence. Being gay wasn’t limited to young white men dancing. In such a short time, I had seen too much. But half way through the parade, Rob and I jumped over the police barricade and joined a group that was passing by. We marched the rest of the way to the Civic Center. Intermittently, we stopped to throw ourselves down on the street in protest to Reagan’s lack of AIDS policy or to shout anthems of gay pride. This was the beginning for me. Afterwards, I thrust myself into gay politics and AIDS activism of the mid-eighties. Routinely, I went to protests ranging from Act Up demonstrations to picket lines callingg for a boycott of Safeway due to their veal policy. I probably cam out to anyone and everyone, wearing my queerness and HIV status as a badge of honor. During the emergence of self I met Ed on a trip to Los Angeles. After many weekly trips up and down the state we moved in together. While living together for the last five years we have created a caring and supportive relationship. We have a dog. Together, we spend holidays with various mixtures of family and friends. We attend family functions as a couple. Three years ago Ed’s brother and his wife had a child, Paige. We were there for the birth, Ed in the delivery room. The recently spent the weekend with us. On Sunday morning Ed and I lay in bed watching the U.S. open and Paige ran into the room and joined us. Together the three of us spent the morning playing games and watching tennis. “Family Tradition: a Gay Evolution,” by David Nelms originally published in Voices ([Forum] 1996, City College of San Francisco). “Time,” by Eric Stromme originally published in City Scriptum ([Forum] 1993, City College of San Francisco). Resembled in this far distant day. Not afraid of great peril but tremble now. But I cannot help receiving your emotions. Sought to grip out minds. of realities in which existed the alternate worlds. “Prideful Menace,” by Catherine Baucom originally published in Mild Perversions (1974, City College of San Francisco).